Heated towel racks offer a number of benefits. Not only do they help eliminate mold and mildew, they can reduce heating costs and add significant style to your home, making them a fantastic addition to existing bathrooms or an attractive consideration during remodels. If you are selecting a free-standing towel warmer, installation should be incredibly simple. These units typically have a plug that can be used in any available outlet, though they should be kept away from water and allowed their own power source when in use. If you would prefer a wall or floor mounted towel warmer, additional considerations need to be made. There are two primary types of floor and wall mounted heated towel racks: electric and hydronic. Most electric and all hydronic towel warmers will need to be connected to existing hot water or radiant heating systems. Some wall and floor mounted electric towel warmers come with a plug. Be sure to install these close enough to an outlet that you will not need to use extension cords or power strips – both of which increase risks for electrical shock in bathrooms. If working with hot water or radiant heating systems is not something you are comfortable with, you should contact a trusted plumber or electrician for installation of any plugless towel warmer. 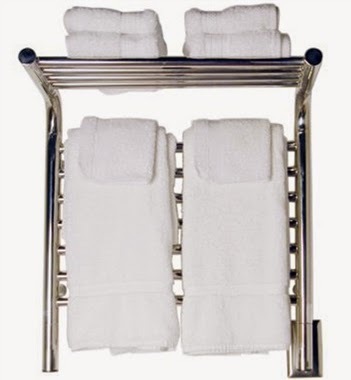 Heated towel racks come in a variety of sizes and styles, enabling them to serve the needs of even larger families. Once installed, these bathroom accessories can enhance the function and style of your bathroom while also increasing the overall value of your home.